Crystal Lake Central took first place in a season-opening event hosted by Huntley High School Tuesday, August 14, 2012 Pinecrest Golf and Country Club in Huntley. 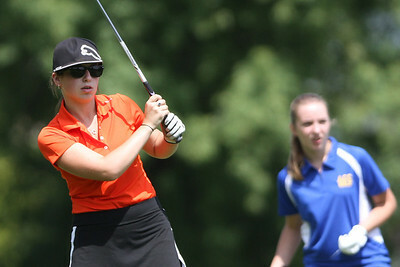 Mike Greene - mgreene@shawmedia.com Crystal Lake Central's Emily Jean putts on the 11th green during a season-opening event hosted by Huntley High School Tuesday, August 14, 2012 Pinecrest Golf and Country Club in Huntley. Jean tied for second place in the event, helping Crystal Lake Central take first place overall. Mike Greene - mgreene@shawmedia.com Crystal Lake Central's Ann Bandolik angles to watch her tee shot on the 13th hole during a season-opening event hosted by Huntley High School Tuesday, August 14, 2012 Pinecrest Golf and Country Club in Huntley. Bandolik took first place in the event, helping Crystal Lake Central take first place overall. Mike Greene - mgreene@shawmedia.com Huntley's Gillian Young tees off on the 13th hole during a season-opening event hosted by Huntley High School Tuesday, August 14, 2012 Pinecrest Golf and Country Club in Huntley. Young tied for second place in the event, helping Huntley take second place overall. Mike Greene - mgreene@shawmedia.com Crystal Lake Central's Bailey Bostler pitches onto the 11th green during a season-opening event hosted by Huntley High School Tuesday, August 14, 2012 at Pinecrest Golf and Country Club in Huntley. Crystal Lake Central took first place overall in the event. Mike Greene - mgreene@shawmedia.com Crystal Lake Central's Brianna DiGrazia prepares to tee off on the 11th hole during a season-opening event hosted by Huntley High School Tuesday, August 14, 2012 at Pinecrest Golf and Country Club in Huntley. Crystal Lake Central took first place overall in the event. Mike Greene - mgreene@shawmedia.com Huntley's Gabby Young prepares to tee off on the 11th hole during a season-opening event hosted by Huntley High School Tuesday, August 14, 2012 at Pinecrest Golf and Country Club in Huntley. Huntley took second place overall in the event, with Crystal Lake Central taking first place. 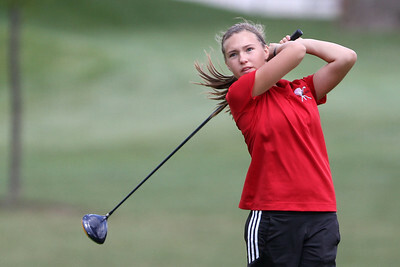 Mike Greene - mgreene@shawmedia.com Huntley's Zoe Dowell tees off on the 12th hole during a season-opening event hosted by Huntley High School Tuesday, August 14, 2012 at Pinecrest Golf and Country Club in Huntley. Huntley took second place overall in the event, with Crystal Lake Central taking first place. Mike Greene - mgreene@shawmedia.com Dundee-Crown's Alexis Howe tees off on the 11th hole during a season-opening event hosted by Huntley High School Tuesday, August 14, 2012 Pinecrest Golf and Country Club in Huntley. Crystal Lake Central took first place overall in the event. Mike Greene - mgreene@shawmedia.com Huntley's Lexi Lowitzki tees off on the 13th hole during a season-opening event hosted by Huntley High School Tuesday, August 14, 2012 Pinecrest Golf and Country Club in Huntley. Huntley took second place overall in the event, with Crystal Lake Central taking first place. Mike Greene - mgreene@shawmedia.com Dundee-Crown's Andie Huml prepares to putt on the 11th green during a season-opening event hosted by Huntley High School Tuesday, August 14, 2012 Pinecrest Golf and Country Club in Huntley. Crystal Lake Central took first place overall in the event. Huntley's Zoe Dowell tees off on the 12th hole during a season-opening event hosted by Huntley High School Tuesday, August 14, 2012 at Pinecrest Golf and Country Club in Huntley. Huntley took second place overall in the event, with Crystal Lake Central taking first place.